Whenever you use any of the paid functions, our system will auto-check your iAccount if you have sufficient credits. If you do not have sufficient credit, you will then be requested to top up your iAccount. How to Top Up Your iAccount? 1. Login to your Lelong.my account. 3. Key in the amount you wished to top up into your iAccount. 4. Choose the payment options available. Option A – You may choose Maybank2U, Maybank Credit Card, CIMB, Visa or Master. This will appear immediately in your iAccount when successful. 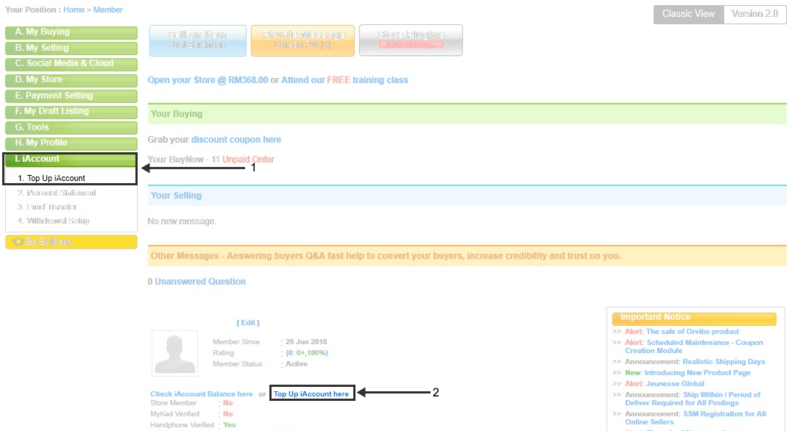 Once you have bank in for the top up, please email the bank slip to us at feedback[@]lelong.my. Please state your userID and the purpose for the top up. When successful, it will usually take 24 hours for the amount to reflect in your iAccount. 1. You can not use the credits/funds in your iAccount to pay for your purchases. 2. You can request for withdrawal from the balance in the iAccount anytime subject to withdrawal service fee of 3.5% plus RM2 for each withdrawal. Approval is at the sole discretion of the company.